I’ve been out of commission with a cold for the past few days—a minor one, but my nose was all stuffed up and my senses of smell and taste were severely compromised. I did manage to roast a chicken with a medley of autumn vegetables: blue potatoes, rutabaga, kohlrabi, carrots, leeks, daikon, and Brussels sprouts. The next night I chopped up the leftovers to make chicken pot pies with sourdough crusts, using Jeremy as a taste-tester to work out the seasoning. But since I’ve made pot pies before, there wasn’t much to write up, so I’ve decided to share a recipe I cooked up several times last winter instead, inspired by the huge number of Brussels sprouts I’m currently trying to use up. This is a very simple pasta dish—only five ingredients!— and yet, as always, I had to make several substitutions. 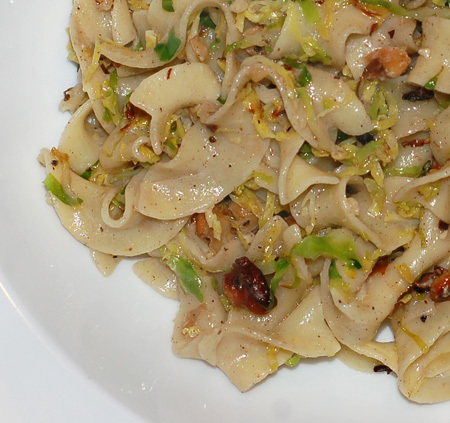 I used wide egg noodles in place of fettuccine, and toasted walnuts rather than pine nuts, which Jeremy dislikes (and I don’t think I’ve ever had!). The Brussels sprouts need to be shredded finely, and I used my mandoline to do it by hand rather than using the shredding disc on the food processor, for a greater degree of control. Or you could always just go with a sharp knife. If you buy a whole stalk of sprouts, the stems provide the perfect handle while you are shredding. I couldn’t resist adding a little punch to the pasta the second time around, and seasoned the sauce with the additions of a bit of garlic, a squeeze of lemon, and a mere splash of cream right at the end. But if even if you aren’t the biggest fan of Brussels sprouts, the dish really doesn’t require embellishment—there is something transformative about the fine shreds intertwining with the noodles. Slice Brussels sprouts very finely using a mandoline, food processor fitted with slicing disk, or a sharp knife. Cook fettuccine in a pasta pot of boiling salted water (3 tablespoons salt for 6 quarts water) until al dente. Meanwhile, heat butter and oil in a large heavy skillet over medium heat until foam subsides, then cook nuts, stirring until golden, 1 to 2 minutes. Add Brussels sprouts with pinches of salt and pepper, then sauté over medium-high heat until tender and lightly browned, about 4 minutes. Reserve 1/2 cup pasta-cooking water, then drain pasta and add to skillet, tossing with enough reserved water to moisten. Serve topped with grated cheese. Considering this has brussel sprouts it looks really good. They are actually my least favourite vegetable, but sliced finely in a pasta dish like this, I may just change my mind. Thanks. Sam, you should give it a try! I grew up thinking I hated Brussels sprouts just because that is what kids do, but I should have known better since I am so fond of cabbage and other brassica. Fine slivers in pasta are a great way to acclimate yourself to new foods; a few months ago, I did just that with fennel (which I think is my entire family’s least favorite vegetable), and we ate it up!